The moments after an accident can be so traumatic, you may not remember very much, especially if you are injured. In any case, the accident scene may be so chaotic it’s impossible to know who was at fault. The progression of events can be unclear. Reconstructing the accident scene therefore requires an additional eye—the lens of your camera. Long before you pursue lawsuit funding, an alternative to settlement loans, your first step should be to document as much as possible at the scene. Accidents are often catastrophic events. Assuming you haven’t sustained major injuries, grab your digital camera or cell phone or tablet and start snapping pictures of the damage. If you are injured, it’s okay to talk to someone else about taking pictures. It can be someone you were with at the time, a bystander who saw the accident, or anyone nearby who is not hurt. The important thing is to take photographs from as many angles as possible to provide thorough documentation of the accident scene. Don’t leave out any detail, as minute as it may seem. Evidence of fault may be found in the location and angle of dents in vehicles, or in how skid marks on the street are positioned. Try to get the clearest photos possible. Using the information in the pictures, investigators can figure out where each vehicle involved was at the time of the accident, and how fast they were going. The full scene: Include as much of the scene as possible, from a variety of angles. Injuries: Photograph the cuts, bruises, and broken bones of you or anyone injured. Traffic signs: Capture nearby streets signs as evidence a automobile driver may have violated traffic laws. Your car: Damage, from dents to major destruction, should be photographed at various distances/angles. All vehicles involved: Take shots that reveal the damage, position of other vehicles in the accident, and proximity to one another. Objects: Street signs, poles, traffic lights, trees, guardrails, and anything else damaged in the crash should be photographed. Skid marks: If they’re from the vehicle that hit you, take pictures at long-range and close up; they can show where the driver applied the brakes or whether they were in control. Reference points: Photograph recognizable buildings, crosswalks, intersections, or any other points of reference. Debris: Create photographic evidence of debris from your car and other vehicles. People: Photograph yourself, occupants of your vehicle, the other driver, occupants of the other car, police officers, paramedics, witnesses, and others at the scene. Without photographs to tell the story, even the best lawsuit loan companies don’t have the evidence they need. 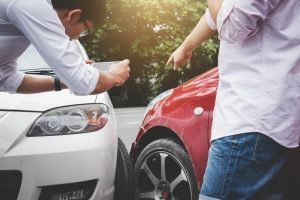 The more information your personal injury attorney has, the easier it is for you to get a cash advance for your car accident, so make sure to take photos if you are ever involved in an accident!